Monday 6 Easy run. Just enjoying the weather. Friday 3 Just logging miles and burning calories. Tired. Saturday 16 15.5 in 2:25 (about 9:19 min / mile). Perfect day for running! Well another super productive week. I don't know who spiked my Gatorade, but whatever they did, I hope it continues. I got in a nice run on Sunday. Normally I am dead legged after a long run the previous day but I felt absolutely fantastic and I took advantage of it and did a speed workout on the bike trail. In terms of time, it wasn't my greatest, but I felt like I completed the workout (and then some). On Tuesday I took advantage of the incredible weather we've been having and knocked out a 4 mile run at about 8:18 pace (33:09 total). That is about 10K pace for me and it was wonderful feeling like I was speeding on the bike trail rather than plodding along. Finally, on Thursday I felt literally untamed. I could've run all night. I haven't had a run where I've felt like that in a very long time. If it wasn't getting dark and cold (and I hadn't had anything to drink), I probably would've done a few more miles. I didn't wear a Garmin for my run, but I remember getting to the 5.5 mile mark and making it back to the start (about 5.15 miles) in about 45 minutes. Saturday's long run was absolutely perfect. It was a little cold at first, but after a mile I was wondering if it was too warm. There weren't that many people on the bike trail either, which was disappointing. I felt really good throughout the run and I definitely covered the distance in a pretty good amount of time. So overall this was a super positive week. Normally I stick with a brand and don't try too much new stuff. However, today I had the opportunity to try two new things on my long run. First off I tried the Salted Watermelon flavor of Gu Energy Gels. I picked up a sample when I did the Las Vegas Marathon and it sat in my stash of gels for a while. To be honest salted watermelon sounded kind of gross. With some trepidation I tried it -- and you know what? Eddie likes it. The salt flavor was very subtle and it went down easily. The watermelon flavor is the most prevalent flavor. It also has a small shot of caffeine in it. I'd definitely buy it. At work, after helping my team win a contest on who exercises the most (was there any doubt? ), I was given a vial of Gu Brew. Usually I just go with plain old Gatorade or Powerade on my long runs but I opted to give this a go. I took a caplet, put it in 16 ounces of water and a few minutes later after it had dissolved (just like an alka seltzer) I had a low calorie electrolyte drink. I had 16 ounces of Gatorade in my belt and 16 ounces of Gu Brew. 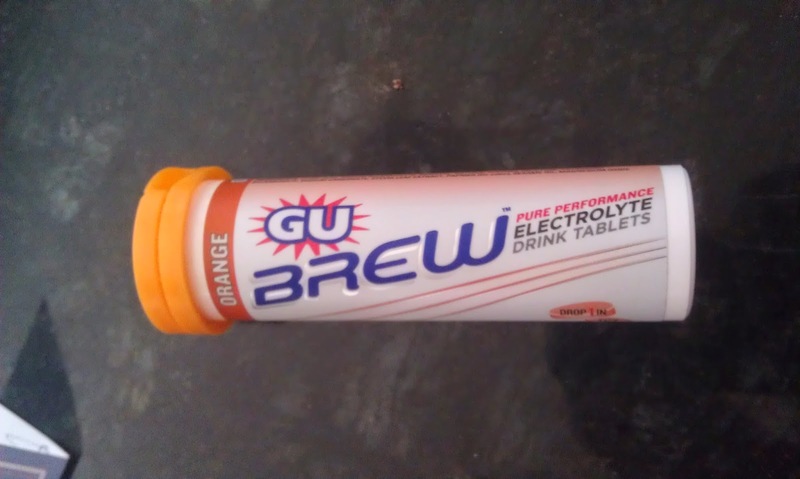 I liked the Gu Brew in that it was far less acidic than the Gatorade. In fact, after this long run, my teeth didn't hurt and my mouth didn't feel like a worn leather baseball mitt. The taste wasn't the greatest. It is made with the Stevia leaf so it has a bit of an after taste. I am not sure it hurt me performance-wise but it was a nice alternative to my usual fluid. Utah continues to have a spectacular early winter. Still no snow and temperatures are in the low 50's or upper 40's. Normally it is 10 - 20 degrees cooler this time of year. The warm weather forecast looks like it continues next week too! I am dying to do a race. I keep getting emails about spring races or races with gimmicks and they sort of break my heart. I don't want to dress in a Santa suit or go through some obstacle type of course. I just want a nice half marathon or even a 5K where all I have to worry about is covering the distance as quickly as possible and competing. There are a bunch of indoor races coming up too. The thought of doing a full marathon or even a half marathon on an indoor track just doesn't do anything for me. Sure it would be nice to have bathrooms at every quarter mile (as well as fluids) but I am not sure I could deal with the monotony. So still, right now the only race I have my ticket is not until late January and February. Maybe I'll do a quick trip to Vegas or California. For racing, this time of year really sort of stinks. At the turn around point on Saturday's long run I decided to snap some pictures. 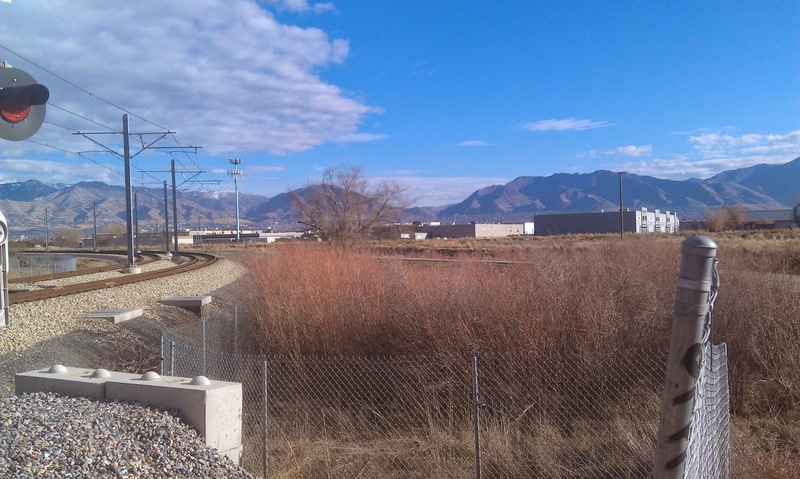 The first picture is looking at the mountains to the east of Salt Lake City. 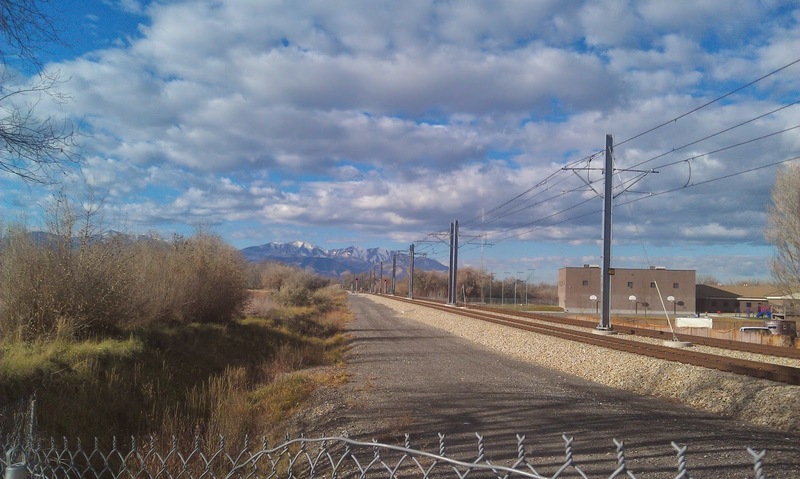 If you look closely at the second one, you can see Salt Lake City in the distance. The 8-mile turn around point is pretty desolate. There are no houses nearby and you just don't see that many people.